Craving a new genre? How about chiptune? 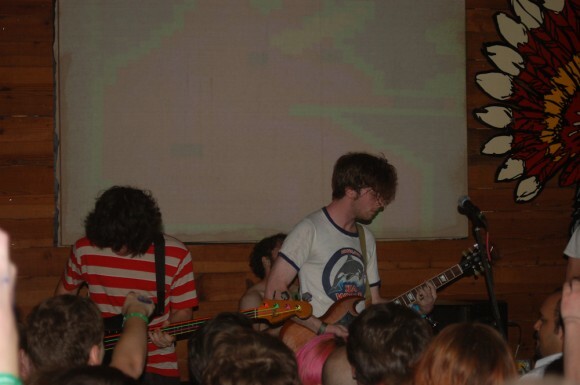 Anamanaguchi are what’s called a chiptune band, meaning they perform music done in the style of or using actual hardware from vintage video game systems. In Anamanaguchi’s case, they’re a rock combo with a hacked Nintendo Entertainment system from 1985. The band is raucous and fun live, the guitars, drums and bass more prominent then on their recorded material. The band played the tiny inside room of The Mohawk where everyone had to crane their necks to see the stage. They were grabbing the crowd’s attention greatly, however, on a technical note, the electronic side of their music was fully just triggered while they played along to it. Not the end of the world from a critical standpoint, but when so much of their sound is what’s triggered it takes a little bit of the excitement out of seeing them perform.